Example: Calculate Number of CI Earthing Plate of 600×600 mm, System has Fault current 65KA for 1 Sec and Soil Resistivity is 100 Ω-Meters. Number of Earthing Plate required =Fault Current / Max.current dissipated by one Earthing Pipe. Number of Earthing Plate required= 65000/545.04 =119 No’s. Total Number of Earthing Plate required = 119 No’s. Overall resistance of 119 No of Earthing Plate=290.14/119=2.438 Ω. Calculate Earthing Resistance of Earthing strip/wire of 36mm Diameter, 262 meter long buried at 500mm depth in ground, soil Resistivity is 65 Ω Meter. Here R = Resistance of earth rod in W.
Number of Earthing Electrode and Earthing Resistance depends on the resistivity of soil and time for fault Current to pass through (1 sec or 3 sec). If we divide the area for earthing required by the area of one earth plate gives the no of Earth pits required. There is no general rule to calculate the exact no of earth Pits and Size of Earthing Strip, But discharging of leakage current is certainly dependent on the cross section area of the material so for any equipment the earth strip size is calculated on the current to be carried by that strip. First the leakage current to be carried is calculated and then size of the strip is determined. For most of the Electrical equipments like Transformer, DG set etc., the General concept is to have 4 no earth pits.2 no’s for body earthing With 2 separate strips with the pits shorted and 2 nos for Neutral with 2 separate strips with the pits shorted. The Size of Neutral Earthing Strip should be Capable to carry neutral current of that equipment. The Size of Body Earthing should be capable to carry half of neutral Current. For example for 100kVA transformer, the full load Current is around 140A.The strip connected should be Capable to carry at least 70A (neutral current) which means a Strip of GI 25x3mm should be enough to carry the current And for body a strip of 25×3 will do the needful. Normally we consider the strip size that is generally used as Standards. However a strip with lesser size which can carry a current of 35A can be used for body earthing. The reason for using 2 earth pits for each body and neutral and then shorting them is to serve as back up. If one strip gets Corroded and cuts the continuity is broken and the other Leakage current flows through the other run thery by completing the circuit. Similarly for panels the no of pits should be 2 nos. The size can be decided on the main incomer Breaker. For example if main incomer to breaker is 400A, then Body earthing for panel can have a strip size of 25×6 mm Which can easily carry 100A. Number of earth pits is decided by considering the total Fault current to be dissipated to the ground in case of Fault and the current that can be dissipated by each earth Pit. Normally the density of current for GI strip can be roughly 200 amps per square cam. Based on the length and dia of the Pipe used the Number of Earthing Pits can be finalized. Calculate Isolated Earthing Rod Resistance. The Earthing Rod is 4 Meter Long and having 12.2mm Diameter, Soil Resistivity 500 Ω Meter. R=500/ (2×3.14×4) x (Loge (8×4/0.0125)-1) =156.19 Ω. Calculate Number of CI Earthing Pipe of 100mm diameter, 3 Meter length. System has Fault current 50KA for 1 Sec and Soil Resistivity is 72.44 Ω-Meters. Number of Earthing Pipe required =Fault Current / Max.current dissipated by one Earthing Pipe. Number of Earthing Pipe required= 50000/838 =59.66 Say 60 No’s. Total Number of Earthing Pipe required = 60 No’s. Overall resistance of 60 No of Earthing Pipe=7.99/60=0.133 Ω. In cases where a single electrode is not sufficient to provide the desired earth resistance, more than one electrode shall be used. The separation of the electrodes shall be about 4 M.
The combined resistance of parallel electrodes is a complex function of several factors, such as the number and configuration of electrode the array. For electrodes equally spaced around a hollow square, e.g. around the perimeter of a building, the equations given above are used with a value of λ taken from following Table. For three rods placed in an equilateral triangle, or in an L formation, a value of λ = 1.66 may be assumed. For Hollow Square Total Number of Electrode (N) = (4n-1). The rule of thumb is that rods in parallel should be spaced at least twice their length to utilize the full benefit of the additional rods. If the separation of the electrodes is much larger than their lengths and only a few electrodes are in parallel, then the resultant earth resistance can be calculated using the ordinary equation for resistances in parallel. In practice, the effective earth resistance will usually be higher than Calculation. Typically, a 4 spike array may provide an improvement 2.5 to 3 times. An 8 spike array will typically give an improvement of maybe 5 to 6 times. Calculate Total Earthing Rod Resistance of 200 Number arranges in Parallel having 4 Meter Space of each and if it connects in Hollow Square arrangement. The Earthing Rod is 4 Meter Long and having 12.2mm Diameter, Soil Resistivity 500 Ω.
R=500/ (2×3.14×4) x (Loge (8×4/0.0125)-1) =136.23 Ω. Now Calculate Total Resistance of Earthing Rod of 200 Number in Parallel condition. Ra (Parallel in Line) =136.23x (1+10×0.146/200) =1.67 Ω. If Earthing Rod is connected in Hollow Square than Rod in Each side of Square is 200=(4n-1) so n=49 No. Ra (In Hollow Square) =136.23x (1+9.4×0.146/200) =1.61 Ω. Note: Restrictions in Thermal settings of system with Detuned reactors are due to limitation of IMP (Maximum Permissible current) of the Detuned reactor. Select a 400A Circuit Breaker. 1.5 to 2.0 x Capacitor Current (In) for Standard Duty/Heavy Duty/Energy Capacitors. For Star-solidly grounded systems: Fuse > = 135% of rated capacitor current (includes overvoltage, capacitor tolerances, and harmonics). For Star -ungrounded systems: Fuse > = 125% of rated capacitor current (includes overvoltage, capacitor tolerances, and harmonics). Care should be taken when using NEMA Type T and K tin links which are rated 150%. In this case, the divide the fuse rating by 1.50. Us = 400V; Qs = 150kvar, Un = 400V; Qn = 150kvar. Example: 12.47 kV, 1500 Kvar Capacitor bank made of three 3 No’s of 500 Kvar single-phase units. Size of Fuse=1.5×69.44 =104 Amp= 100 Amp Fuse. If a capacitor fails, we say that It may approximately take 3x line current. (3 x 69.44 A = 208.32 A). It will take a 100 A fuse approximately 500 seconds to clear this fault (3 x 69.44 A = 208.32 A). The capacitor case will rupture long before the fuse clears the fault. The solution is using smaller units with individual fusing. Consider 5 No’s of 100 kVAR capacitors per phase, each with a 25 A fuse. The clear time for a 25 A fuse @ 208.32 A is below the published capacitor rupture curve. Size of capacitor circuit conductors should be at least 135% of the rated capacitor current in accordance with NEC Article 460.8 (2005 Edition). Size of capacitor for Transformer No-Load compensation. The transformer works on the principle of Mutual Induction. The transformer will consume reactive power for magnetizing purpose. Following size of Capacitor Bank is required to reduce reactive component (No Load Losses) of Transformer. The capacitor provides a local source of reactive current. With respect to inductive motor load, this reactive power is the magnetizing or “no load current“which the motor requires to operate. A capacitor is properly sized when its full load current rating is 90% of the no-load current of the motor. This 90% rating avoids over correction and the accompanying problems such as over voltages. The most accurate method of selecting a capacitor is to take the no load current of the motor, and multiply by 0.90 (90%). Example: Size a capacitor for a 100HP, 460V 3-phase motor which has a full load current of 124 amps and a no-load current of 37 amps. If the no-load current is unknown, a reasonable estimate for 3-phase motors is to take the full load amps and multiply by 30%. Then multiply it by 90% rating figure being used to avoid overcorrection and over voltages. Example: Size a capacitor for a 75HP, 460V 3-phase motor which has a full load current of 92 amps and an unknown no-load current. No-load current of Motor=Full load Current (92 Amp) X 30% = 28 Amp estimated no-load Current. Size of Capacitor =No load amps (28 Amp) X 90% = 25 Kvar. It is widely accepted to use a thumb rule that Motor compensation required in kvar is equal to 33% of the Motor Rating in HP. Capacitors installed for motor applications based on the number of motors to have power factor correction. If only a single motor or a small number of motors require power factor correction, the capacitor can be installed at each motor such that it is switched on and off with the motor. As the motor, while still in rotation after disconnection from the supply, it may act as a generator by self excitation and produce a voltage higher than the supply voltage. If the motor is switched on again before the speed has fallen to about 80% of the normal running speed, the high voltage will be superimposed on the supply circuits and there may be a risk of damaging other types of equipment. As a general rule the correct size of capacitor for individual correction of a motor should have a kvar rating not exceeding 85% of the normal No Load magnetizing KVA of the machine. If several motors connected to a single bus and require power factor correction, install the capacitor(s) at the bus. (1) If solid-state starters are used. (2) If open-transition starting is used. (3) If the motor is subject to repetitive switching, jogging, inching, or plugging. (4) If a multi-speed motor is used. (5) If a reversing motor is used. (6) If a high-inertia load is connected to the motor. Fixed power capacitor banks can be installed in a non-harmonic producing electrical system at the feeder, load or service entrance. Since power capacitor banks are reactive power generators, the most logical place to install them is directly at the load where the reactive power is consumed. Three options exist for installing a power capacitor bank at the motor. Install between the upstream circuit breaker and the contactor. This location should be used for the motor loads with high inertia, where disconnecting the motor with the power capacitor bank can turn the motor into a self excited generator, motors that are jogged, plugged or reversed, motors that start frequently, multi-speed motors, starters that disconnect and reconnect capacitor units during cycling and starters with open transition. Larger, more cost effective capacitor banks can be installed as they supply kvar to several motors. This is recommended for jogging motors, multispeed motors and reversing applications. Since capacitors are not switched with the motors, overcorrection can occur if all motors are not running. Since reactive current must be carried a greater distance, there are higher line losses and larger voltage drops. Large banks of fixed kVAR with fusing on each phase. Install between the contactor and the overload relay. This location can be used in existing installations when the overload ratings surpass the National Electrical Code requirements. With this option the overload relay can be set for nameplate full load current of motor. Otherwise the same as Option 1. No extra switch or fuses required. Contactor serves as capacitor disconnect. Change overload relays to compensate for reduced motor current. Too much Kvar can damage motors. Calculate new (reduced) motor current. Set overload relays for this new motor FLA.
Usually the best location for individual capacitors. Install directly at the single speed induction motor terminals (on the secondary of the overload relay). This location can be used in existing installations when no overload change is required and in new installations in which the overloads can be sized in accordance with reduced current draw. When correcting the power factor for an entire facility, fixed power capacitor banks are usually installed on feeder circuits or at the service entrance. Fixed power capacitor banks should only be used when the facility’s load is fairly constant. When a power capacitor bank is connected to a feeder or service entrance a circuit breaker or a fused disconnect switch must be provided. Existing motors when no overload change is required. Can be switched on or off with the motors, eliminating the need for separate switching devices or over current protection. Also, only energized when the motor is running. Since Kvar is located where it is required, line losses and voltage drops are minimized; while system capacity is maximized. Installation costs are higher when a large number of individual motors need correction. Overload relay settings must be changed to account for lower motor current draw. 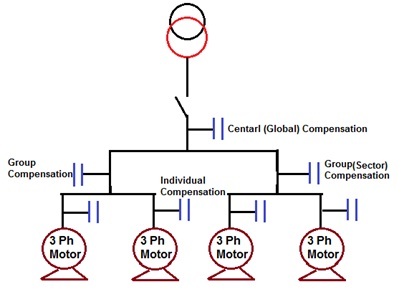 The location of low voltage capacitors in Distribution System effect on the mode of compensation, which may be global (one location for the entire installation), by sectors (section-by-section), at load level, or some combination of the last two. In principle, the ideal compensation is applied at a point of consumption and at the level required at any instant. The capacitor bank is connected to the bus bars of the main LV distribution board to compensation of reactive energy of whole installation and it remains in service during the period of normal load. Reduces the tariff penalties for excessive consumption of kvars. Reactive current still flows in all conductors of cables leaving (i.e. downstream of) the main LV distribution board. For this reason, the sizing of these cables and power losses in them are not improved by the global mode of compensation. The losses in the cables (I2R) are not reduced. No billing of reactive energy. Makes less demands on the transformer. Capacitor banks are connected to bus bars of each local distribution Panel. Most part of the installation System can benefits from this arrangement, mostly the feeder cables from the main distribution Panel to each of the local distribution Panel. Reduces the tariff penalties for excessive consumption of kvar. Reduces the apparent power Kva demand, on which standing charges are usually based. The size of the cables supplying the local distribution boards may be reduced, or will have additional capacity for possible load increases. Losses in the same cables will be reduced. Makes less demands on the supply Feeders and reduces the heat losses in these Feeders. Incorporates the expansion of each sector. Reactive current still flows in all cables downstream of the local distribution Boards. Where large changes in loads occur, there is always a risk of overcompensation and consequent overvoltage problems. Compensation by sector is recommended when the installation is extensive, and where the load/time patterns differ from one part of the installation to another. Capacitors are connected directly to the terminals of inductive circuit (Near to motors). Individual compensation should be considered when the power of the motor is significant with respect to the declared power requirement (kVA) of the installation. The kvar rating of the capacitor bank is in the order of 25% of the kW rating of the motor. Complementary compensation at the origin of the installation (transformer) may also be beneficial. Directly at the Load terminals Ex. Motors, a Steady load gives maximum benefit to Users. The capacitor bank is connected right at the inductive load terminals (especially large motors). This configuration is well adapted when the load power is significant compared to the subscribed power. This is the technical ideal configuration, as the reactive energy is produced exactly where it is needed, and adjusted to the demand. Reduces the size of all cables as well as the cable losses. From a technical point of view this is the ideal solution, as the reactive energy is produced at the point where it is consumed. Heat losses (RI2) are therefore reduced in all the lines. Significant reactive currents no longer exist in the installation. Not recommended for Electronics Drives. Most costly solution due to the high number of installations. The fact that the expansion coefficient is not incorporated. Individual compensation should be considered when the power of motor is significant with respect to power of the installation.